Level 3 Assets - What Does It Mean? 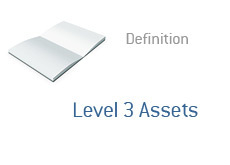 What are level 3 assets? What is the definition of level 3 assets? Level 3 assets are financial assets and liabilities that are very illiquid and hard to value. Many publicly traded corporations have many billions of dollars of level 3 assets on their balance sheets. Level 3 assets, on the other hand, are illiquid and extremely hard to value. Level 3 assets trade so infrequently that there is no reliable market price for them, so an accurate market value can not be calculated. Companies can try to determine values through pricing models, but these can not be counted on as being accurate.